By forging business relationships with nearby companies and proactively introducing overmolding as an aesthetic and structural benefit, an Idaho molder has carved out a successful niche. With sporting goods OEMs like Smith in its backyard, Tooling Express Inc. (Bellevue, ID) developed designs like the molded-in strap for these goggles to help it win steady business. Success for many molders lies not in pursuing fanciful visions of what your business could be, but in realistically appreciating what your business inherently is. Lonnie Tustison, tooling manager of Tooling Express Inc. (TEI), has adopted the latter view, and in doing so, accepted his shop’s weaknesses and exploited its strengths to the betterment of TEI’s bottom line. This outlook has increasingly led TEI to multicomponent or overmolding jobs, leaning heavily on the experience of Tustison and his two fellow toolmakers. Geographically isolated in Bellevue, ID, Tustison says TEI, under the leadership of president Owen Downard and his son Evan, has forged relationships with local customers, proactively introducing overmolding‘s aesthetic and functional benefits to win business. A short cross-country ski trip from many of its customers, TEI has capitalized on proximity to Sun Valley’s ski country and worked hard to win the confidence of local sporting goods OEMs like Smith and Scott. TEI actually started as a tool shop supplying molds to a local molder that worked for Scott. Ten years ago when that molding shop went under, Scott said the parts business was TEI’s if it would buy a molding machine, so the company obliged and promptly became a custom molder. Molding the goggle straps into a clip rather than manually threading them enabled TEI to reduce material scrap and assembly time for clients like Smith and Scott. 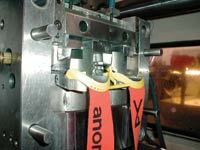 TEI devised a manual process for strap loading that cut 6 seconds from the quoted cycle time for an automated setup. 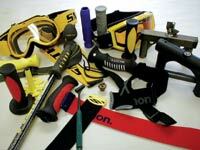 The first major project TEI took on for Scott was a two-component ski pole grip. Given only an epoxy model of what Scott was looking for, TEI was forced to reverse engineer the part. Running one press, TEI designed a mold for the PP inner component and a separate tool that held that PP insert to overmold thermoplastic rubber (TPR). Tustison says TEI spent a year “dialing [the mold] in?and performing secondary machining before it produced the parts suitable for Scott. Its diligent efforts were rewarded, however, and although Scott eventually pulled most of its operations into Europe, that initial program served as a launching point for TEI’s success. The grip remains a source of pride for Tustison and TEI, especially after its production was attempted in Europe with mixed results. 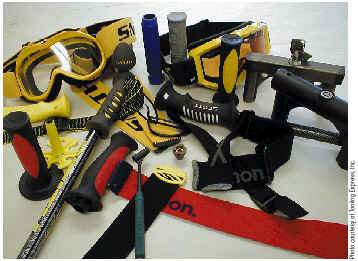 Soon after, TEI was contacted by a Norwegian company for ski pole grips, and another local OEM, Smith, followed fast behind with various sporting goods components. Tustison says that things (appropriately) “snowballed?from there, and soon the company had seven presses (55 to 375 tons), a CNC EDM, a three-axis machining center, and a CNC lathe. The investments in technology were important, but it was the knowledge gleaned from that first pole grip tool that has proven invaluable for TEI. Of the many lessons Tustison says TEI learned, the most important was to view the cycle in reverse. The key was positioning the PP insert into the second mold and supporting it in a linear and lateral fashion. Tustison says the process TEI adopted defies some common shop knowledge, but that it was critical to the part’s success. Located in the heart of Idaho’s ski country, TEI used an innovative, overmolded ski pole grip created for a local company to branch into other sporting goods parts. By using multimaterial designs, it was able to enhance product appearance and functionality. Tustison says TEI doesn’t have the luxury of doing flow simulations on all of its jobs, but that doesn’t mean it shoots the first parts into a mold with its fingers crossed. For most parts, prototype tools are initially cut from aluminum with only one cavity so there’s room to try different gating scenarios or runner configurations. Including Tustison, TEI has just three full-time toolmakers, but it still managed to crank out 20 molds last year, and that tally is closer to 30 if you count the prototype tools. The company also performs short-shot series and other tests, but through all processes, the quest for knowledge remains paramount. TEI continues to market its knowledge of overmolding, and an aggressive strategy recently won it some new business. Smith is one of the largest goggle manufacturers in the world, and just one of its lines constitutes 6 million pairs annually. TEI had long coveted, and won, some of the smaller components for the goggles, but it realized a new design could provide an excellent opportunity for deeper penetration and actually save Smith money in the end. In Smith’s initial goggle design, the elastic strap was sewn onto a clip attached to the goggle frame. Working literally from a bar napkin sketch, Tustison and TEI’s president came up with a new design that called for the strap to be molded into the goggle frame. This eliminated the clip as well as the labor to sew it on. They designed and cut a mold in the evening, shot some crude-looking but fairly representative parts the next morning, and brought the new concept to Smith—just down the road—the same day. Smith was immediately enamored with the aesthetic appeal and durability of the new design. TEI considered automating the process, and had even purchased a turnkey manufacturing cell centered on a Sumitomo injection molding machine at a trade show, but when the automation package fell through, TEI developed a streamlined, manual-loading process that shoots two goggle straps out of the tool with molded ends in a cycle that’s 6 seconds faster than was quoted with automation. TEI still doesn’t have a preponderance of “gravy? jobs that Tustison desires, but things remain busy, including work on goggles with molded-in straps for coalition troops in Iraq and a recently patented integrated slider-clip design for strap adjustments. When Tooling Express, Inc. (TEI) ?a Bellevue, ID-based mold shop that specializes in sporting good molds ?branched into the molding part of the business to further define its niche and improve its moldmaking process, it soon faced the challenge of finding a quality tool steel to work with that also would shorten deliveries by reducing machining times and post processes such as heat treating. International Mold Steel's off-the-shelf NAK 55 MUD style bases allowed Tooling Express to get it's customer's products ready on time. injection molding machines ranging from 55 to 165 tons, TEI also has second operation facilities such as pad printing, ultrasonic welding, and minor assembly and packaging of its customer's products. The object of overmolding ?or insert molding ?is to place either a metal or plastic item into a mold and close on it. 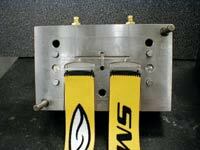 “This is something that most injection molders try to avoid,? Downard explains. “But here we are in our own private Idaho, doing it all day long on purpose. Plus, the quick-change inserts load in and out of a master frame that can be reused over and over again, eliminating the need for each mold to have its own “A?support plate and “B? side ejection box or U-frame. “This obviously offers some cost savings due to fewer materials being needed, but more importantly, it allows the moldmaker to focus on the more highly detailed core and cavity work,?Downard explains. The greatest challenge of this type of work, he continues, is that most often there is no real life part geometry to work from. A customer’s only concern is that it works and achieves the desired look when assembled. When components for the final assembly are being made all around the world with no real hard numbers to call law, quite often final “tweaking? is necessary. For this reason, weldability of the mold insert material is crucial, and Downard points out that it can be welded without any evidence of the weld on the part. For more information contact Paul Britton of International Mold Steel (Florence, KY) at (859) 342-6000 or visit its website at www.imsteel.com.